This year, midway through Argentina’s 2005–2015 Strategic Plan for Biotechnology, a long-stalled update of the Seed Law circulating in Buenos Aires may finally reach the legislative floor. The current law, which facilitated the rapid boom of transgenic crops in Argentina in the 1990s—60% of Argentina’s soy crop was genetically modified for herbicide resistance within three years of the introduction of Roundup Ready soy—is a source of conflict over intellectual property rights, as it permits farmers to retain seeds without paying royalties. However, the meteoric rise in GM crop production was not solely the function of the seed law. Compatible agricultural practices in the early 1990s and a welcoming government contributed. Critics and fans alike say it’s a model from which other developing countries can learn important lessons. Critics warn of agribusiness’s disproportionate influence on government, an influence they say has created an explosion of monoculture that jeopardizes the businesses and health of small farmers. Conversely, Argentine farmers and investors continue betting on GM varieties, arguing that the increased yields and financial returns have helped prop up the country’s ailing economy. The question now is whether other countries will continue to look to Argentina as a role model in the adoption of GM crops. Moises Burachik, a senior scientist at the Buenos Aires-based National Commission for Agricultural Biotechnology Assessment (CONABIA) and part of a team responsible for assessing the risks of GM crops, worked through his recent summer vacation to get through a backlog of applications. Together with his counterparts at the National Service for Food Health and Quality (SENASA, Buenos Aires), who study the impact of new products on human health, Burachik has a growing to-do list and brimming calendar. Burachik is proud of the group’s performance in enabling Argentina’s biotech boom, but he is concerned that understaffing and outdated regulations are holding back field trials and commercialization. And although Argentina was once second in the world only to the United States in terms of transgenic acreage, this year the country slipped into third place behind Brazil, which has been expanding cultivation of biotech crops. Bureaucratic hurdles are not the only things slowing down GM crop adoption; there is also a lack of public investment in agricultural research in Argentina. And although Argentinean regulators approved a new variety of maize (the Swiss-based Syngenta’s Bt11xGA21 GM maize), which represents the next generation of transgenic crops, in Brazil a national research group recently independently produced its own herbicide-resistant form of GM soybean, something Argentina has yet to accomplish. In some ways, it’s surprising that Argentina has been such a trailblazer for biotech crops; part of the reason for that was the willingness of politicians and their scientific advisers nearly two decades ago to create the necessary infrastructure. In 1991, when representatives from the California company Calgene (now Monsanto), Nidera of Rotterdam, Holland, and Swiss giant Ciba-Geigy (now Syngenta) approached Argentine government officials about running field trials of herbicide- and insect-resistant cotton, maize and soy plants, they found that Argentina had no regulatory framework in place. But, Burachik says, “The technical staff convinced the bosses that this was a new green revolution.” The government invited industry groups to join a newly formed commission, the predecessor to CONABIA, to make technical recommendations on field trial protocols and GM crop approval. “Of course, there were conflicts of interest, but the industry representatives were there on behalf of their sector, not their companies,” and recused themselves from discussions relating to their firms, Burachik recalls. Ties between the Argentine government and large agricultural landowners have a long history, dating back to the 19th century, when the government attempted to pay down its debt by taxing exports of crops such as wheat and maize. But the close ties are also a source of criticism, with groups such as the Grupo de Reflexión Rural of Buenos Aires (http://www.grr.org.ar/), which claims that a revolving door between large-scale agricultural firms and government gives the firms informal contacts, insider knowledge and undue sway over regulatory proceedings. Although strong connections and influence between agribusiness and government predate the arrival of biotech, they have played an important role in paving the way for its swift adoption, says Peter Newell, an international development researcher at the University of East Anglia, UK, author of a recent study of the politics of Argentina’s biotech boom1. 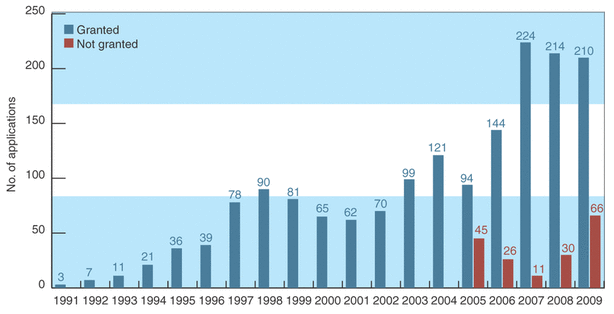 The early trickle of commercial field trial applications turned into a stream, reaching 90 in 1998, the year Europe stopped approving new GM crops for import (Fig. 1). Today, new applications for field trials are often for crops containing multiple transgenes stacked in the same plant. In some countries, these would also be required to undergo fresh field trials, but in an effort to streamline the process, in 2007 Argentina began evaluating such crops based on each separate GM crop’s field trials. Despite these and other government efforts to keep up with new technology at the commission level, Monsanto’s corporate affairs director Pablo Vaquero in Buenos Aires says that reorganizations at the Ministry of Agriculture, where final decisions on new commercial crops are made, have slowed down trial applications. It is typically 5 to 6 years from applying for a field trial to the first commercial plantings, but even a relatively short delay at the wrong time of year can add an entire year to the cycle, agrees Burachik. The Argentine agricultural industry in the 1990s was ripe for biotech soy for other reasons, too. Following the example of a few pioneers in the 1970s and 1980s, many Argentine landowners in the mid-1990s began adopting low-till or no-till practices, in which seeds are drilled by machinery directly into the ground. Argentina has about 2.5 million hectares under no-till practices today, according to the Argentine National Institute of Agricultural Technology. Also known as direct seeding, the process allows farmers to plant soy crops on the same fields as wheat in the off-season, permitting a massive increase in the amount of cultivation possible. Crucially, the method required heavy machinery but little labor, handing an advantage to large landowners with capital and economies of scale at about the same time as the first GM soy crop reached the Argentine market. Larger landowners began buying up individually owned plots, leading to violent confrontations. Farmers eagerly turned over land previously devoted to cattle or domestic food crops and cut down forests to plant Monsanto’s Roundup Ready soy, which resists the herbicide glysophate, and was the first GM crop approved in Argentina. Ecological luck also played a role: “The single fact that is probably most important in accelerating the speed of approval [in Argentina] is that there are no wild relatives of soy,” notes Val Giddings, president of PrometheusAB, a biotech consultancy in Silver Spring, Maryland. In part because most GM products were exported for animal feed and partly because of consumer apathy, say observers, there was little public reaction in the first years of biotech plantings. Today, when the Buenos Aires office of the US Department of Agriculture’s Foreign Agricultural Service (FAS) runs public events promoting GM crops, environmental or consumer groups don’t bother showing up, says Andrea Yankelevich, who works for the FAS in Buenos Aires. Newell says that the national media portrays growers as heroic engines of economic growth, often siding with agribusiness against government attempts at regulation or taxation. Argentina’s intellectual property laws helped to lower the cost of adoption. Argentina adheres to the 1978 International Convention for the Protection of New Varieties of Plants (UPOV 1978), which permits creators of new plants to charge an initial license fee, but exempts growers from paying annual fees for new seeds. For maize, creators are able to earn their R&D costs back because the plants are not self-fertilizing and growers must buy the seeds each year. Soy is self-fertilizing and although Argentine farmers may not legally distribute seeds, under UPOV 1978, they are permitted to retain seeds for their own use. UPOV updated its terms in a 1991 convention to limit this practice, but Argentina and its partners in the Southern Common Market (Mercosur) have not signed on to the new convention. When Roundup Ready soy arrived in Argentina, it was under license to Asgrow Argentina, a multinational owned at the time by the American-based Upjohn Company of Kalamazoo, Michigan, which seed and grain importer/exporter Nidera of Buenos Aires subsequently acquired. Nidera spread the seeds widely and legally throughout the country, but illegal trade, nicknamed ‘white bag’, had already begun. During that time, Monsanto made much of its Argentine income from selling the patented Roundup Ready herbicide that accompanied Roundup Ready–resistant soybeans. By the time Monsanto applied for a revalidation patent on its Roundup Ready–resistant soy in 1995, Argentina had signed TRIPS, the international “trade-related aspects of intellectual property rights” agreement that does not recognize revalidation patents. Argentine courts could deny the Monsanto application on the principle that the transgenic seed was already widely distributed and part of the public domain. In 2003, Monsanto withdrew its soy business from Argentina, though the firm still sells various formulations of Roundup Ready herbicide there and reported $183 million in gross receipts from Argentina in its fiscal 2008–2009 year, making Argentina its third-biggest regional market2. A consequence of the Argentinean legal environment was that the price of legitimately licensed seeds fell, giving Argentine exporters a small but noticeable advantage in global markets. This prompted the US government and the American Soybean Association, headquartered in St. Louis, to put pressure on developing countries like Brazil not to import Roundup Ready soybeans from Argentina. By then, however, the trade in illegal seeds had spread beyond Argentina’s borders into agriculturally similar parts of Brazil and Paraguay. Monsanto also took its case to importers of Argentine products in countries where Monsanto did have a patent. Its lawyers claimed that the use of Argentine Roundup Ready soy on which no royalty had been paid was illegal under its agreements with importers in Spain, the UK, The Netherlands and Denmark. Argentina argued that the agreements applied only when the transgene was used for the patented function—protecting living plants from Roundup Ready herbicide—but that soy derivatives such as oil were not protected. Monsanto lost its court cases in Spain and the UK in 2007, and the Dutch case was referred to the European Court of Justice in 2009. That trial’s ruling, which is expected this year, will probably guide any other rulings in Europe. Paolo Mengozzi, advocate general, wrote an opinion for the Court in March favoring Argentina, though the Court has yet to make its final ruling. Roxanna Blasetti, director of international relations for the Ministry of Agriculture, says that the government has its hands tied with regard to issuing Monsanto a patent for the original Roundup Ready soy today. “The government cannot recognize private ownership of a public property,” she says, and because the Roundup Ready gene is in the public domain in Argentina it would set an “unimaginable” precedent. As it became a major producer of GM soy, Argentina had to tackle the issue of trade barriers to its exports. In 1998, under pressure from consumer and environmental groups, the European Union (EU; Brussels) stopped approving GM agricultural products for commercial use. The US then brought a case against the EU before the World Trade Organization (WTO) in Geneva. Canada, another large GM crop exporter, joined the case, which argued that the EU was taking too long to approve new transgenic crops for import. For Argentina, the case for joining the fight was less clear-cut. “Argentina did not have as many [GM] products in the pipeline as Canada and the United States, so its primary motivation was to encourage compliance with WTO rules,” says Blasetti, who was involved in Argentina’s negotiations. Some Argentine exporters feared the repercussions of a drawn-out trade conflict with one of their biggest customers. Ultimately, the risk of the precedent set by the European moratorium prevailed over fears of a trade conflict and the Argentine government decided to join the North American plaintiffs before the WTO. By August 2003, some European nations began approving transgenic crops again, though WTO rulings would take until late 2006 to come down in favor of the American plaintiffs. The argument hinged not on whether GM crops were safe for Europe, but whether Europe’s approval process was consistent with its obligations under existing trade agreements. Canada and Argentina have since agreed on calendars for approving the backlog of transgenic crops that accumulated during the moratorium and information sharing to ease new approvals. Yet during the moratorium, Argentina was already asserting more trade independence thanks to its ties with other markets, including China and India. For example, China and Argentina signed a memorandum of understanding in 2004 that lets China import soy and Argentina import herbicide. Argentina also exports unrefined soy oil to India. Thus, Argentina’s alliances, widespread trade network and farming infrastructure are all part of the story of its early success with biotech crops. In the years since GM crop cultivation took hold, internal conflicts have started to influence the country’s biotech crop production capacity. Most recently in 2008, under pressure to redistribute some of the wealth generated by high commodity crop prices, Argentine president Cristina Kirchner instituted a new floating export tax that increases when international prices are high and decreases when prices are low. Farmers blocked highways, and camped out in Buenos Aires in protest. “There is a populist view of the world coming from the government in which there is a certain confrontation with business and farming,” observes Eduardo Trigo, a biotech analyst in Buenos Aires for consulting firm CEO. Accusations that soy has taken over Argentine politics are interchangeable with arguments about beef producers 30 years ago or wheat growers 150 years ago. As Trigo notes “government power is very centralized here,” and has always been close to landowners, despite spats over taxation and regulation. Argentina’s neighbors Paraguay and Brazil began making up for lost time a few years ago after taking a wait-and-see stance during biotech’s first decade in Argentina. They contain regions geographically similar to some in Argentina and were beneficiaries of illegal seed smuggling in the late 1990s. Public debate there, although strong in the first decade of GM crops, mostly died down as farmers have grown accustomed to the smuggled GM seeds. “It’s a non-issue” in Paraguay, Trigo says, and regulatory authorities have developed a nimbler set of rules for approval and implementation of new transgenic crops there. Paraguay also reinvests a fraction of its biotech export tariffs in domestic biotech R&D, notes Yankelevich, unlike Argentina where most biotech R&D is privately funded. Brazil has approved about a dozen commercially approved biotech crops now and, according to Burachik, it is approving trials at a faster rate than Argentina. In fact, Giddings argues that “one of the things that’s driving the Argentines has been competitive pressure vis-à-vis their colleagues across the Rio Plata.” Climate and soil conditions vary widely across other developing countries, even in South America, which contains mountain desert environments in the Andes, semi-arid plains in the Argentine Pampas and tropical rainforest in the Amazon Basin. Yet the majority of biotech crop R&D still focuses on temperate climates like that of North America. “It’s very difficult to believe that biotech soy’s success in Argentina will be repeated with another crop or in another country,” Trigo says. The debate over GM crops is much louder in other developing countries. In Peru, which still lacks regulation to enforce its biotech law, opponents have called for a moratorium on the import of biotech products and claimed to detect transgenes in cultivated crops. A scientist who contested these claims is currently facing criminal charges for defamation (Nat. Biotechnol. 28, 110, 2010). Greenpeace is sponsoring a “Brazil Better Without Transgenic” advertising campaign and some consumer-facing food processors and retailers are hesitant to adopt biotech products, though they remain popular with producers3. 1. Newell, P. J. Latin Amer. Studies 41, 27–57 (2009).